So you found the perfect safe, the one that is the right size, the perfect price point and has the security you need. You’ve bolted it to the floor, set your combination and have begun to move your collection and valuables in there. Only you quickly realize that a few shelves aren’t enough to organize everything you have. In all honesty, the actual capacity of a safe is always smaller than what is advertised. And then the built in shelving further “cuts up” space. Making it even more restrictive to what you can put in there. The gun safe is doing what it does best. Keeping things secure. But that doesn’t mean it’s good at keeping moisture out, organizing and maximizing the space you have, or illuminating the interior. Pistol Organization, Door Organization, Lighting Systems and Dehumidifiers. Keep reading to find out our favorites and why! 4.1 How do they work? Pistols are one of the most difficult things to organize effectively. Laying them down on a shelf often takes up a lot of space and makes them difficult to access quickly and safely. There are a number of options in this regard. A lot of door organizers come with built in handgun holsters. We’ll review those further down. You can use shelf-top gun racks, into which you lay your pistol. Or in barrel organizers that hang the gun from below the shelf. This is useful if you’ve already filled up your shelves with ammo or other items. These are in barrel gun hangers. They vaguely resemble large square ’S”. One section is placed on the top of the shelf, allowing a rod to hang from the bottom, into which the gun barrel is inserted. It can be used on a 22” caliber handgun and above, the rods are also covered in rubber for a snug fit and to prevent any damage. This pack of hangers contains 4 individual hangers. They aren’t welded together, so you can hang each pistol individually wherever you’d like. As long as the gun isn’t longer than 10 inches it can hang from any standard shelf. This really maximizes shelf space and personally I like the “floating gun” look that these types of organizational tool give. Tip: The shelf you’re hanging these on should be one inch thick and ten inches deep. Get more info on these pistol hangers at Amazon here. This bundle is perfect for anyone who has a large handgun collection. In total, this bundle will allow you to hold 22 guns, which is more space than most will need. It’s much more cost-effective than buying the pieces separately. There are a few advantages to getting this bundle even if you don’t own 22 handguns. Because you get the hangers and racks, you have more flexibility with organizing your handguns. Maybe you have 6 pistols, but want to hang 2 of them and put the other 4 in a rack. It all depends on how you want to organize your safe. This product comes with a pack of gun hangers and three shelf top gun racks that can hold 4, 6 and 8 guns. The racks are covered in a rubber coating to prevent damage to your pistols and give them a snug fit. Depending on the shape of your pistols, you might be able to fit some small boxes of ammo below the pistols. If you’d prefer to buy them individually, you can, but they’re more pricey. Follow the link below and you’ll find the individual pieces in the related items section. Find the complete bundle on Amazon here. Door organizers are an excellent way to make use of that extra space in your safe, and they allow you to store a number of smaller items. They’re especially great for holding more pistols or anything that would roll around in the safe otherwise. Like flashlights or coins. Most are made from fabric and have pouches you can use for storage. The cheaper versions are held to the door using velcro, which is very easy to install but won’t hold much weight, depending on the quality of the adhesive. The higher end versions come with clasps that you can use to hook onto the inside of the door, so check your safe first to make sure this is possible. As it may not be with all models. If that is the case we recommend using aftermarket adhesive strips. Many of them can hold a significant amount of weight and will save you having to drill through the inside of your safe just to get some more storage space. This Stack-On gun safe accessory is a mesh door organizer and is made for Stack-On safes. It fits perfectly into the dimension of their long gun safes. But should fit without issue into other brands as well. This type uses self-adhesive velcro stickers to hold onto the door, which means if you don’t plan on storing anything too heavy in your upright safe you should be alright. Otherwise, you may want to drill small holes to secure it better. You can find this on Amazon here. Some reviewers have taken helpful pictures that can give you a better idea of how it looks inside a safe. This is the ultimate on door hanging organizers for mid to large-sized gun safes. This model utilizes clips to secure it from falling down or swaying when the door is opened. If your safe has nowhere for the clips to hook into, but you like this product you can utilize the aftermarket adhesive strips. This organizer measures 49”x19” and includes handgun holsters, zippered pockets, mesh organizers and long gun velcro holsters. Allowing you to increase your long gun storage by 2 on any given safe. It also comes with sewn in pistol storage, so you might be able to just get away with buying this instead of pistol organizers. Note: Depending on where your shelves are in the safe, a pocket or holster on this door organizer that hits the same location as the shelf might have issues. You may not be able to use all the pockets in the door simply because a shelf might be in the way when you try to close it. If your gun safe is much larger than the dimensions of this door organizer, you may need to look at other options. The straps may not fit the entire door of your safe. Overall, this is an excellent choice, and we recommend you buy the largest product your safe can hold. That way your collection can grow into it, as opposed to you having to buy another organizer. If you think this is the right door organizer for you, check it out on Amazon here! An incredibly understated piece of equipment. But being able to see what’s in your safe is integral. There are several choices in this matter, if your safe has a hole for an external cable to be routed through, you can buy a light that is plugged in. If not your only option is to choose a magnetic or adhesive battery operated unit. Be careful to purchase something that is LED as that uses less electricity and that your safe is organized in such a way that your chosen product can illuminate it, in its entirety. To see a complete review of several gun safe lighting systems, go here. This product is a light bar with three rotating heads, each with four LED’s inside. The product can either be turned on and off manually or can be set to motion sensor mode, which will allow it to turn on when the door to your safe is opened. I highly recommend getting an option that has a motion sensor. It’s much easier to deal with than fumbling in the dark for a light switch inside your safe. You can choose between two levels of brightness, depending on your wishes. And the adhesive allows you to place it anywhere in your safe. Many people opt to install it below a shelf or at the top of the safe so the light can shine down. It takes 6 AAA batteries that will last for months with occasional use. The only downside is if you have shelves this will not illuminate your entire safe, but just a section of it. If your safe is quite large, you may want to invest in 2 of them. Check out the Stack-On SPAL-300 here at Amazon. This is a rather interesting product, as it is a battery operated, adhesive LED light strip. The lights are coated in a silicone sleeve, as opposed to PVC. Over an extended period of time PVC dries up and releases an acidic film that can do damage to your firearms. It takes a while but still better safe than sorry. The primary benefit of this product is that it can be placed on the inside rim of your safe, so that when turned on it will illuminate everything, you don’t have to settle for simply hanging something from the top of the safe. This product also comes with a door switch. Which works on a similar principal to a fridge light, when the switch is pressed in by the closed door, the light is off. When the door is open, the light is on. Even though it isn’t a motioned sensor, it can still work off of the movement of your gun safe door. It’s difficult to revolutionize the lighting industry, but this product has found an excellent solution to the problem. If rope lighting seems like your cup of tea, check it out here at Amazon. 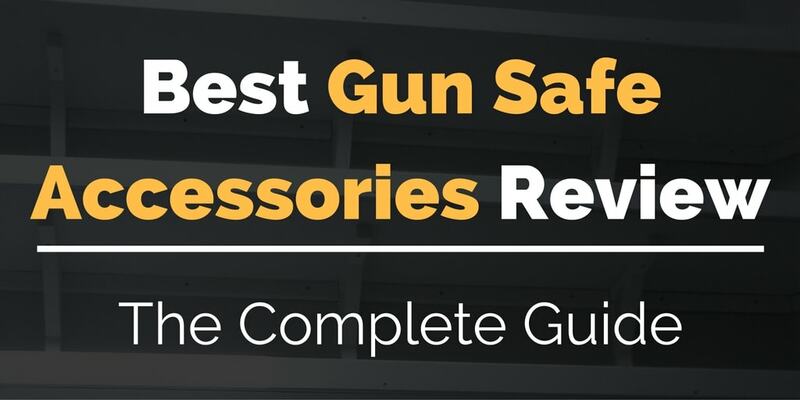 These are necessary if you live in a damp climate, or have your gun safe stored in an unfinished basement, garage or shed. Fire and theft aren’t the only threats our guns face. Moisture is the real killer, and over time your firearms will rust. Your electronics will short out, the carpet will become moldy and the inside of your safe will generally become a very nasty place to store your items. For these reasons a dehumidifier is an essential piece of equipment. Thousands of dollars worth of variables and firearms can be ruined without one. The goal for any safe is to keep your valuables at a relative humidity of under 60%. This will prevent rust and mold, to put that into perspective, museums keep their exhibits at a relative humidity of just under 50%. If it’s good enough for the Mona Lisa, it’s good enough for your firearms. There are several types of dehumidifiers out there, each work based on a similar principle but use various methods to attain it. Some use a chemical desiccant (like silica gel) to absorb excess moisture, once the product can no longer hold any more water, you will have to heat it up or recharge it. Others blow the air over a heating coil, which causes the water to condense, it is then stored in a basin and can be disposed of later. A select few models warm the surrounding area, which prevents moisture from forming in the first place. These only work in enclosed, small areas like boats and closets. But for our purposes they are suitable. For our full review of dehumidifiers and the science behind them, go here. This is the most popular electronic gun safe dehumidifier. The smallest size can effectively keep moisture below 50% for an area of 100 cubic feet by warming the air around it and not allowing moisture to appear in the first place. Another added benefit is that this product doesn’t need to be recharged for any absorbed water to be disposed of. But it will require you to have a hole in your safe for the plug to be routed through. Or if you have a waterproof safe, make sure you have an outlet inside. It comes in different sizes depending on what size your gun safe is. If you live in a moist area or keep your gun safe in the basement, I highly recommend this as an option. It’s something you plug in once and don’t need to think about again. It comes with a lifetime warranty and uses 35 watts of electricity. Find the GoldenRod here on Amazon. I’d recommend this for smaller gun safes. A more compact solution from Stack-On, this unit requires no batteries, can be mounted to any spot in the safe and a single night of charging will allow it to pull moisture for 4-6 weeks. There is an indicator on the unit that tells you when it can no longer absorb any more water. At that point, you remove it from the safe and plug it into charge for an entire evening in a well-ventilated area (like a garage or bathroom) where it will purge all of its retained water back into the atmosphere over an 8-10 hour period. This creates a no mess solution to moisture problems but does mean you will have to periodically check the product to make sure it is still doing its job. For small safes in dry regions of the US, this is a perfect option. Find the Stack-On SPAD-1500 here on Amazon!